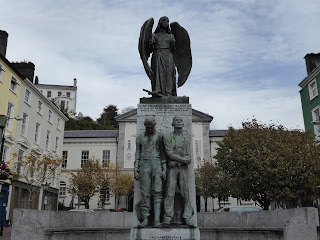 Memorial to all who perished in The Lusitania. This is Cork. 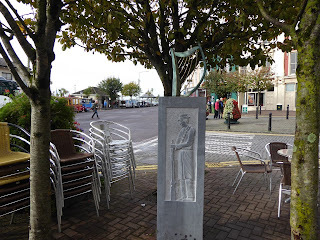 This is located in the town square. 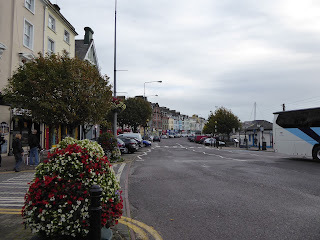 A very pretty little seaside town, lots of pretty flowers, and lots of little pubs. The back of the stone. If you look directly across the street, you'll see the ticket office which is directly in front of the long locked harbor where the Titanic departed from. The Easter Rising, also called The Easter Rebellion started on Easter Monday, April 24th 1916, and ended on April 29, 1916. It took place primarily in Dublin, but also in Meath, Galway, Louth, Wexford and Cork. The Rebellion was against The British. The leaders of the rebellion hoped for help from Germany since Germany was against The British in WWI. They did obtain one shipment of firearms from Germany. 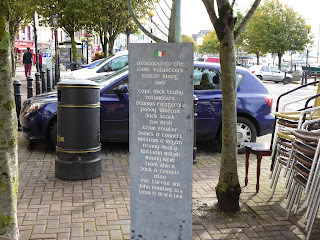 They also expected their fellow Irishmen to join them once the fighting started and they declared a free Irish State. Most Irish did not support them. There were approximately 1600 followers of the cause. A small number easily handled by The British is a handful of days. Somewhere around 2,000 were killed or injured during the standoff. The leaders were than executed. Once the leaders were executed The British continued with martial law, and arrest some 3,000 citizens they believe had been involved, or supported the rebellion in anyway. Those arrested did not have any trials to determine their guilt or innocence. The British sent about 1800 of those 3,000 to England where they remained prisoners, never having a trial. The quick executions, mass arrests, and imprisonment turned many Irish against England. This made those executed Martyrs of the Cause. **These aren't my pictures, but my friends Jane's. Her's were better than mine.